Size |D x L|: KP-20 :: 0.020 Dia. X 3" KP-26 :: 0.026 Dia. X 3" KP-41 :: 0.041 Dia. X 3" KP-55 :: 0.055 Dia x 4" KP-86 :: 0.086 Dia. X 4" KP-148 :: 0.148 Dia. X 4"
Select a Price Break and Pin Size |D x L| in the menus above. Spring-pins are used for ejectors, lifters, and kickers. Spring and/or rod can be cut to length to suit your application. Each spring-pin consists of a hardened steel rod soldered to a compression spring. Looking for Metric sizes? (See Examples Below) A spring-pin can eject a sheet-metal part after cut-off. This can prevent the sheet metal from being held against the stripper by stamping-fluid surface tension. Spring-pins can prevent slug pulling. This can prevent the slugs from being pulled upward out of the matrix when the die opens. 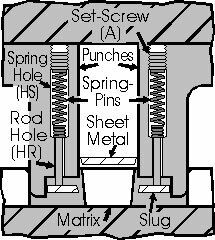 The spring-pins eject the slugs by overcoming the stamping-fluid surface tension which can cause the slugs to adhere to the ends of the punches. A spring-pin can delay the actuation of an electrical switch. Set-screw included. * All dimensions are in inches if not specified otherwise. Please contact us if you need help or a special size. Example 1 : a cut-off die. After a sheet metal part has been cut-off a Nu-Tec spring pin can eject it. The spring on the right shows the sheet metal being pushed away from the stripper. This action can prevent stamping-fluid surface tension from negatively affecting the discarded sheet metal piece. Example 2 : a notch punch. 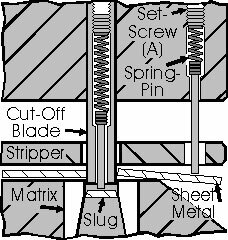 To prevent vertical movement of slugs out of a matrix after a die opens a Nu-Tec spring pin can push slugs away from the punch ends. Slugs can also adhere to punch ends due to stamping-fluid surface tension. The spring pin has enough force to eject the slugs and prevent this from occurring. Example 3 : a switch delay. 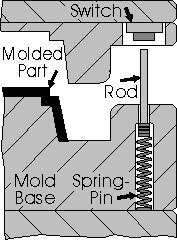 When a mold is partially or completely closed the rod from a Nu-Tec spring pin can apply pressure to a switch. This delays the electrical system from engaging. As shown below, once the mold is completely open the switch is released allowing full functionality. Also, using a spring pin in this manner can be part of an automated system.